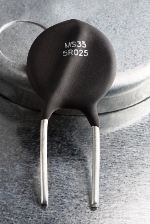 The MS35 Series of inrush current limiters by Ametherm are capable of handling up to 800 Joules of energy and 10 A to 50 A of steady-state current. These power thermistors are rugged and built to last even in the most demanding high-power applications. The MS35 Series play a key role in alternative and green energy applications by avoiding current spikes in power generated from wind turbines, solar panels, and other sources as it’s fed into batteries, inverters, and additional energy storage components. These inrush current limiters are also used to regulate the release of battery energy in electric vehicles and in pre-charge circuits for many different types of battery chargers.